Remove and discard spinach stems. Rinse well. Pat dry, tear into bite size pieces, arrange in salad bowl (a straight edged bowl works well). Evenly layer spinach, cucumbers, radishes, green onions and eggs. Spread dressing over top. Chill up to 24 hours. 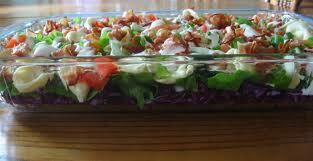 Before serving add bacon and peanuts...and the spinach salad recipe is ready to serve,..enjoy the salad !